The garter is luxury embroidered tulle gathered into a pure silk band, the flower sits on fine toning bows. The horseshoe is bound in the same bow ribbon, toning with the pure silk. Are you looking for real luxury? Would you like blue or ivory silk? The blue could be your something blue, but don’t worry, the ivory has a tiny blue bow inside too, so you’re covered 🙂 Also your garter can be personalised inside with your names and the date of your wedding, making it the perfect keepsake. Crystal centers may vary, but will always be pretty! Includes logo tissue and luxury gift box with champagne bow. Luxury embroidered tulle gathered into a pure silk band. The daisy flower with it’s sparkling crystal, sits on fine toning bows. I carefully bind the horseshoe in the same bow ribbon, toning with the pure silk. Imagine the pleasure a little one will have, being given the important role of presenting the horseshoe. Your photographer will love you for it, it’s always a great photo! If you’re looking for something extra special, you’ll appreciate that I’ve used rare Nottingham lace. Look closely at the detail, embroidered ivory threads, on a gorgeous champagne colour tulle. It’s one of my favorite laces, however I now just have a few meters left! The manufacturer made lace for Princess Diana’s wedding too and told me all about it. I must write that blog post, I’m sure you’d find it interesting. Personalise inside with your names and the date of your wedding, you’ll make it the perfect keepsake. 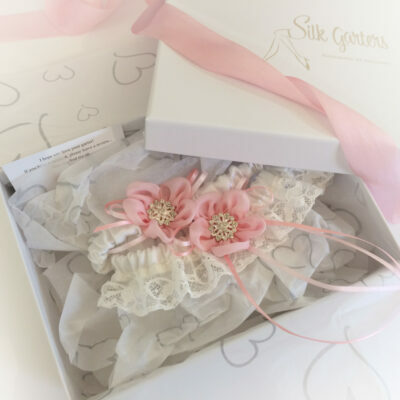 Mothers most frequently choose this set as a gift for their daughter, I’ve had some lovely messages of thanks when they’ve arrived 🙂 Presenting your gorgeous garter gift is all taken care of too because it includes logo tissue and luxury gift box with champagne bow.